This day hike could start from Bali Lhakhang to Junidrak/Katsho Goenpa. It may take around 3 hours approximately. It is an easy climb through Katsho village with a beautiful view of traditional houses and ruins. Enroute visit Bali Lhakhang which is dedicated to Guru Rinpoche and also the privately owned Lungkha Lhakhang. While ascending to Junidrak and Katsho Goenpa it will take you through the pine forest with beautiful flowers blooming in spring. 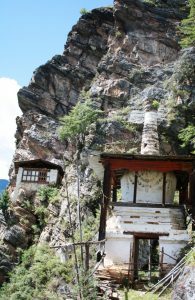 You can either climb up to visit Katsho Goenpa and then visit Junidrak Nye and walk down or climb up to Junidrak and then visit Katsho Goenpa. On the way, you can see traditional cow milking, milk churning to produce butter and cheese balls in a semi permanent cowshed. It is also a good spot if you wish to have picnic lunch in the meadow above Kadam Chorten. Junidrak Nye is dedicated to Guru Rinpoche and houses the right footprint of Mache Lhabdron (1055-1132), a female Tibetan Tantric practitioner. It is believed that her left foot print is at Pelphug/Paro Taktshang. It is built on/in a cliff at 2950 m and privately owned by a household in Katsho village. It is a pilgrim spot/sacred place. While going to Katsho Goenpa (3070m), you can either climb up above the rocky cliff of Junidrak Nye or travel by car (3 km farm road) from Haa town. However, some people find it very terrifying and challenging taking the first alternative. Katsho Goenpa dedicated to Guru Rimpoche is a very sacred monastery founded by Lama Choying Gyatsho. There is now a monastic school at the goenpa. Annually a hundred million recitation is held from the beginning of the 30th day of the twelfth month and continue untill the 20th day of the first month. While up in Junidrak Ney and Katsho Goenpa, you will not only have a good senic view of the Haa valley but a good photo opportunity. The village of Yangthang is three kilometres from Haa town in the direction of Damthang. It is a beautiful revived village that is centrally located. The village can be a hub for tourism attractions such as day hike to Yangto Goenpa, Gemtey Goenpa and Tshenka Goenpa, camping ground at Jangkhakha (Chungdue ground), biking trails to Haa town and Damthang. The village showcases various other activties such as traditional sports, festival (Yongto Bonko), hotstone bath and cultural programmes. There is a big ground below the villages which is being used as archery range. Traditional sports can be held in this ground where the tourists can participate or watch as spectators. Village tours can be organized in Yangthang village while interested visitor can avail the services of experience homestay/farm house stays nearby. For those who are interested in outdoor camping, the village is bordered by beautiful campsites. Jangkhakha is an open meadow near the farm road, few meters away from Yangthang village. 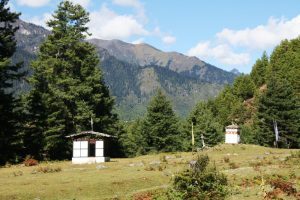 While this place is often used by tour operators as the campsite, it is in this beautiful meadow where prayers and offerings to Ap Chundu (the protecting deity of Haa and Paro) are made. These celebrations (locally known as the birthday celebration) in honor of Ap Chundu are made annually during the 10th month of the Bhutanese calander. Once an appropriate date is fixed by astrologers, people form the longest traditional procession from the glorious Lhakhang Karpo and proceed to the meadow to make sacrificial offerings every year. 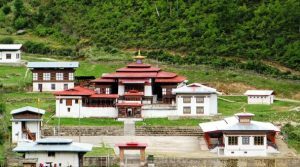 Like Yangthang village, Jangkhakha can be developed as hub for tourism attraction activities like nature walk, day hike to Jamtoe Goenpa and Yangto Goenpa, bird watching, butterfly tour, camping, picnic and biking/bicycling. In addition, if you are adventurous you can begin the two most beautiful trek, the Haa-Paro Sagala trek (2-3 Days) or the Chelela Nature Trek (2 Days) from Jangkhakha. 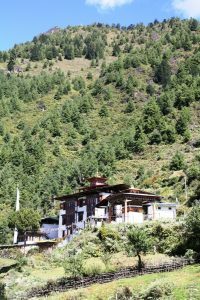 Jamtoe Gompa: According to local tradition, the Goenpa was founded by Drupthob Tshewang Trashi, but later relocated and restored on the present location by the 13th Je Khenpo Sherub Gyeltshen. The main shrine of Jamtoe Goenpa has Jowo Jamba (future Buddha) and Chenreyzig (god of compassion) as central figure in the first floor, Goenkhang (chamber of the deity) which houses two unidentified statues of male and female- male upside down and female upright in the second floor. The chamber of 13th Je khenpo Sherub Gyeltshen is in the third floor. The monks perform Torjab (ritual cake ceremony) on 10th day of the 1st month of Bhutanese calendar to ward away the evil and bring peace to the valley, country and the people. One can drive an hour or take a nature walk (approx. two and a half hours) from Yangthang. 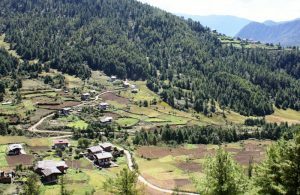 One alternate trail is a walk down through Haatey village, cross Haa chhu and climb about three hours uphill to the Goenpa. On the way you can get a good photo opportunity of Haa valley and Yangto Goenpa. Enroute visit Tshenka Goenpa privately owned temple above Talung village. Tshenka Goenpa was initially founded by Gyalwa Gotshangpa Gonpo Dorji in 1189 during the fourth Rabjung cycle. Goenpa Tashi, Goenpa Mani and Shingyed Chhams are performed on 14th and 15th day of the Bhutanese calendar. Yangto Goenpa: Yangto Goenpa is one of the four largest temples of Haa valley and is sitiuated on the hilltop of Chubugang in Yangthang village. According to the history of Lhodruk Chojung, the Goenpa was founded by Lama Thinley Gyatsho, the great disciple of Lama Drakpa Gyatsho, a renowned Buddhist master of the seventeenth century. It’s a two storyed structure with an Avalokiteshvara shrine in the lower storey and a shrine of Dhrmakaya, Sambhogakaya and Nirmanakaya and the shrine of the lama in the upper storey. Every year a hundred million recitation ceremony is held during the first month of the Bhutanese calander. 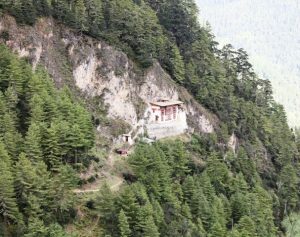 A nature day hike to Yangto Goenpa either from Yangthang village or from Jangkhakha can be undertaken which is approximately an hour walk. While taking the walk you can also witness people working in the field or organise a village tour to understand and experience the lifestyles of the Haaps. Further a biking tour to the Goenpas will be something one would not like to miss. Meri puensum is a unique landmark of Haa valley and there is a great deal of folklore relating to these three hills. The three brother (sister) hills of Haa Dzongkhag present a breathtaking view, like heaps of flour in the middle of the valley. They appear equal in height, in a line, and upright in positions without tourching another. It has been said that these three hills are embodiments of the lords of the “Three Families” with left hill representing Manjushiri (God of Knowledge), the central one representing Avalokiteshvara (God of Compassion), and the right one representing Vajrapani (God of Power). 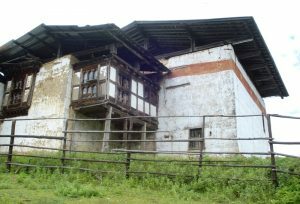 Oral tradition and local historians maintain that two important temples in Haa Dzongkhag, the Lhakhang Karpo and Lhakhang Nagpo, which literally translates into the White Temple and the Black Temple, were built at the same time as Kichu Lhakhang in Paro and Jambay Lhakhang in Bumthang in the 7th century AD by king Songtshen Gampo. “It is said that rays of light once emanated from the body of kind Songtshen Gampo; Lhakhang karpo was built on the site where the white rays of light had fallen and Lhakhang Nagpo was bulit where the black rays of light had fallen. According to another account, a white pigeon and a black pigeon, which were emanations of King Songtshen Gampo, flew to the respective sites on where the two temples are built”. The two temples can be found near each other at the sacred site known as Meri Puensum or The Three Brother/Sister Hills. 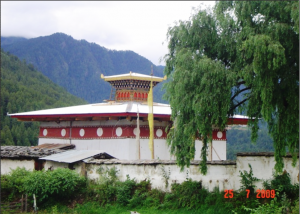 Lhakhang Karpo (White Temple) is located above the main road at about 5 km away from Haa town. 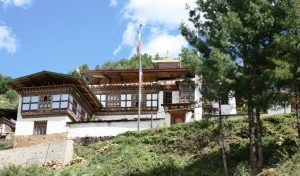 Today it houses the district monastic body of Haa Dzongkhag. 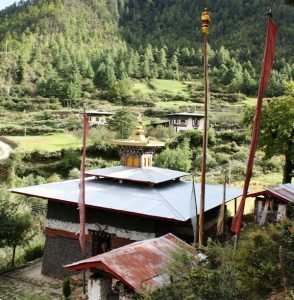 Lhakhang Nagpo: A quarter of an hour hike above Lhakhang Karpo is the Lhakhang Nagpo (Black Temple). These Lhakhangs are related to legends of Chungdue, the local deity. Also near the Black and the White Temple is a special chorten marking the site where an imprint of Guru Padmasambhava’s body and hat can be found in a large rock. Near the Black Temple, there are two houses near a sacred oak tree where the local deity once appeared as a winged creature, scaring the local people (the valley is divided into a number of areas, each under the influence of a particular local deity predating the arrival of Buddhism). The residents of the two houses gave offerings to the local deity. The local deity, now appeased, visited the upper house while neglecting the lower. The jealous owner of the lower house began an inter-house feud in which a man of the upper house was killed. Every year 11th lunar month a series of special mystical practices are performed in the upper house for a week. Takchu Goenpa: Takchu Goenpa is situated above the Lungtsho village, 8 kilometers along the secondary road from Dumchog Bridge. Lama Sangay Gyatsho, the head of the Dhaling Dzong settled in Haa and built the historical Takchu Goenpa. In Dzongkha “Tak” means “Tiger” and “Chu” means “Water” and the name of the monastery is a compound of these two nouns “Takchu”. Above the monastery, there is a naturally –formed tiger head and from its mouth flows clean water giving rise to the name of the temple. A good nature day hike to Takchu Goenpa from Dumchog village can be undertaken which will take approximately 2-3 hours walk. A homestay and village tour programme can also be included at Dumchog village to exprerience the traditional Bhutanese lifestyle. One can drive or bike all the way to Takchu Goenpa and hike downhill towards Dumchog village by visiting Shelkardra on the way or take a day excursion over the ridge, enjoying the scenic beauty of the valley and end at kajena village in Haa town. The scared place of Guru Rimpoche is located behind the Avalokiteshvara hill, which is the middle hill of the three brother/sister hills. To get there you will have to drive from Dumchog Bridge via road toward Takchu Goenpa. Once you reach the turn below the lungtsho village, you have to leave your car and walk for half an hour to reach the temple. The etymology of the name is that the rocks of the cliff appear like crystal which in Dzongkha is known as “Shel”. In Dzongkhag “Kar” is the root word for White and “dra” is cliff. There is a temple in which the sixth speech incarnation of Zhabdrung Jigme Tenzin stayed for very long time when he was young. On top of Shelkardra, there is a flat-land where it is said that the fortunate can see a lake and a variety of fruits. It is said that the water pond by the cliff appeared as a pond of milk to Rani Choying Dorji during the time she was carrying her royal grandmother Ashi Kesang Choden Wangchuk, the queen of third king, in her womb when she was passing through the Banyel village above Wangchuk lo Dzong. Gyechukha Lhakhang lies around 11 km north of Haa valley which is the birth place of the local deity, Chungdue. The lhakhang is located below the road and one has to walk a little way to reach there. It is said to have been built by Lama Ugyen Thinley. The Blue and Red faced statues of Ap Chungdue stands on either side of the main altar. At the back of the lhakhang near a willow tree, there is a rock in the shape of a seat. People believe this to be a place where Zhabdrung Nawang Namgyal sat and rested. On the right side there is a water source believed to be sacred to Ap Chundu. Oral tradition says that since this temple is a scared place of Ap Chundu people living above Yakzam cannot rear pigs and, even if they eat pork, they cannot roast it. 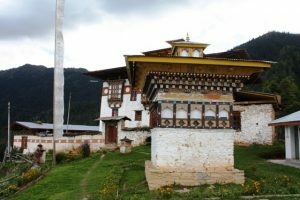 During Chungdue’s birthday celebration, the caretaker (Koenyer) of Gyechukha Lhakhang will be the only person allowed to set up altar and make offerings at Jangkhakha (Chungdue’s ground). Drana Trashidingkha Goenpa (3265m) was a religious seat of the second speech reincarnation of Zhabdrung, Chogley Sacha Tenzin (1736-1780), the founder of Sangchokho monastery in Paro. After driving a little past Katsho School, you will come across the path leading to the monastery. You should leave your car at Ingo and hike/walk about two and half hours to Drana Trashidingkha Goenpa (3265m) through Kajena village into the refreshing pine forest. The monastery was looked after by the community living there. However, when the communities settled permanently at Kajena, it was handed over to the Dratshang Lhentshog. Drading Tashi Chhoeling Shedra was established in 2008 with 22 monks. Annually hundred million Mani recitations and a recitation ceremony of Kanjur for the well being of the country and people are performed. One can have a spectacular view of the Haa valley and also towards Damthang from the monastery.